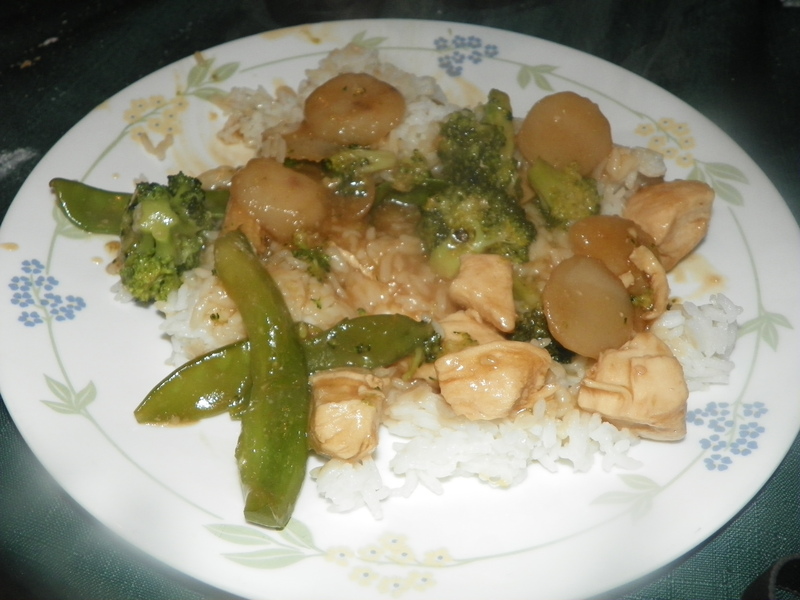 #My First Post Revisited Challenge – A Moo Goo Gai Pan Recipe – What's for Dinner Moms? The first day of our new game was a rousing success. To celebrate the Chinese New Year I found a recipe for Moo Goo Gai Pan at Allrecipes.com. Heat 1 tablespoon of vegetable oil in a wok or large skillet over high heat until it begins to smoke. Stir in the fresh mushrooms, broccoli, bamboo shoots, water chestnuts, and straw mushrooms. Cook and stir until all the vegetables are hot, and the broccoli is tender, about 5 minutes. Remove from the wok, and set aside. Wipe out the wok. Heat the remaining tablespoon of vegetable in the wok until it begins to smoke. Stir in the garlic, and cook for a few seconds until it turns golden-brown. Add the chicken, and cook until the chicken has lightly browned on the edges, and is no longer pink in the center, about 5 minutes. Stir together the cornstarch, sugar, soy sauce, oyster sauce, rice wine, and chicken broth in a small bowl. Pour over the chicken, and bring to a boil, stirring constantly. Boil for about 30 seconds until the sauce thickens and is no longer cloudy. Return the vegetables to the wok, and toss with the sauce. *I tripled the amount of sauce it recommended (using the Sherry) and tripled the amount of garlic to suit my families tastes. I also added more broccoli, green peppers, baby corn and left out the straw mushrooms. 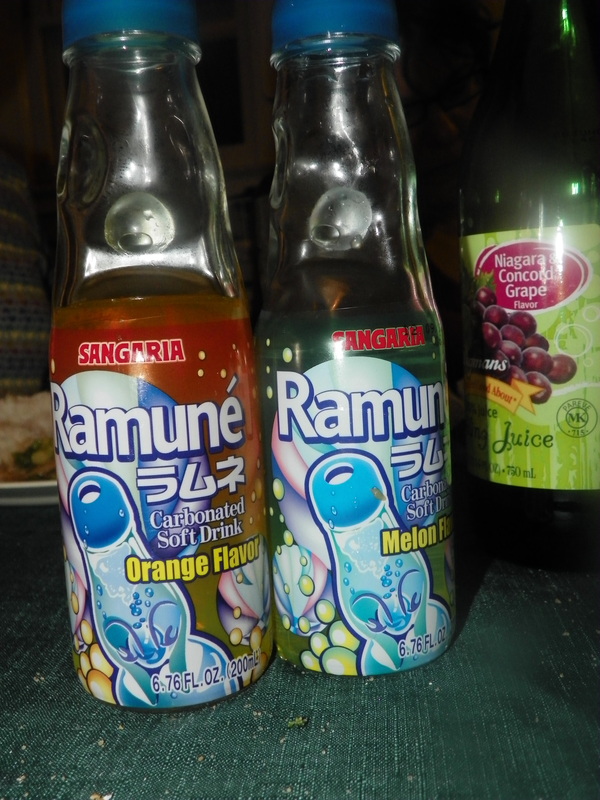 To round out the special meal I bought Japanese soda for the kids to try to had Fortune Cookies at the end of the meal. It was a hit! I served the dish over rice and my kids were licking their plates at the end of the meal. I am definitely keeping this recipe to use again someday. It was fun to go back and look at some of my early posts. This blog is a bit of a journal of our lives. My children were 8 and 11 when we began the dinner game. There were not very many posts the first year as we moved half-way across the country so I really don’t ever think about this time of blogging too much. It was great to see how much I have changed, my blog has changed, and my family life has changed. Thank you Terry, from Spearfruit.com (click for link to blog), for the challenge! If you haven’t visited Terry’s blog please check it out. He is an amazing man who shares honestly from his heart about his life. I am not nominating any one person but challenging you all to go back and look at your original post (as is) and think about when you started blogging and where you are now. You cooked just as great back then as you do now! Thank you. It really was fun to go back and look at how my blog has changed. I could see the growth and it made me feel like I am growing and making progress. Thank you! It was fun and I hope some people stop over to your blog. You write so beautifully and from the heart that everyone should read it! It’s interesting that you posted this. I’m currently in the midst of doing a cleanup of my blog and it’s crazy how much has changed since I first started. I guess it’s a good sign of us growing and becoming more comfortable in our niche in the blogging world. I keep thinking I need to go back and change somethings but part of me thinks it is part of my evolution as a blogger, mom, and person. Hard decision to decide to delete and or clean them up. Thank you, Lynne! It was strange and kind of made me feel good to see how far I have come with my blog and everything.